Guyana is an independent nation located on the north coast of South America just east of Venezuela. Colonized initially by the Dutch, it was conquered by the British during the Napoleonic Wars and became the colony of British Guiana in 1831. The country gained its independence in 1966. 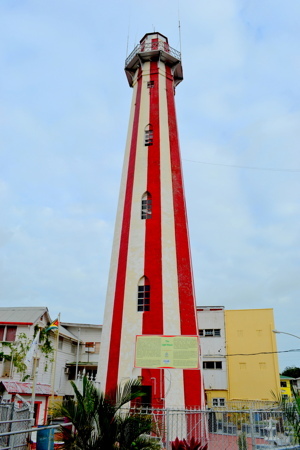 Georgetown, the national capital and major port, is also the site of the country's one traditional lighthouse. New Amsterdam is the second international port. Aids to navigation in Guyana are presumably operated by the Guyana Transport and Harbours Department. Photos by various photographers posted by Alexander Trabas; the Guyana photos are by Capt. Peter Mosselberger ("Capt. Peter"). Navigational chart information for Georgetown harbor. Date unknown. Active; focal plane 17 m (56 ft); white flash every 5 s. 17 m (56 ft) skeletal tower, painted white, mounted on a square platform supported by piles. No photo available but Google has a satellite view. Located on the west side of the entrance to the Demerara River. Accessible only by boat. Site open, tower closed. Admiralty J6843.1; NGA 17300. 1830 (station established 1817). Active; focal plane 31.5 m (103 ft); flash every 60 s, red or white depending on direction. 30 m (98 ft) octagonal stone tower with lantern and gallery, painted with red and white vertical stripes. A photo by John and Elaine Chesterton is above, Amanda Richards has a wider view, a good 2011 photo is available, Angelina Archer has a photo of the light in action, Huelse has a historic postcard view, and Google has a street view and a satellite view. Nigel Durrant's August 2011 photo shows the lighthouse freshly repainted and he also has a good photo of the historical display on the lighthouse. Lightphotos.net has a historic postcard photo. The lighthouse is a principal tourist attraction in Georgetown, the nation's capital. In 2003 a team from the Smithsonian Institution cleaned and restored the clockwork mechanism that rotates the lens. Visits to the lighthouse were suspended in September 2015 due to the need for repairs. As of March 2019 it is still closed. Located at the end of Water Street, marking the east side of the mouth of the Demerara River. Site open, tower closed pending repairs. ARLHS GUY-001; Admiralty J6841; NGA 17292. Date unknown. Inactive since about 2010. Listed as a 26 m (85 ft) skeletal tower, painted yellow. This tower has been abandoned. Amanda Richards has a 2013 photo and Google has a satellite view. Located on the Atlantic coast about 25 km (15 mi) southeast of Georgetown. Site status unknown. ex-Admiralty J6852; ex-NGA 17312. Date unknown (lightship station established 1902). Destroyed. 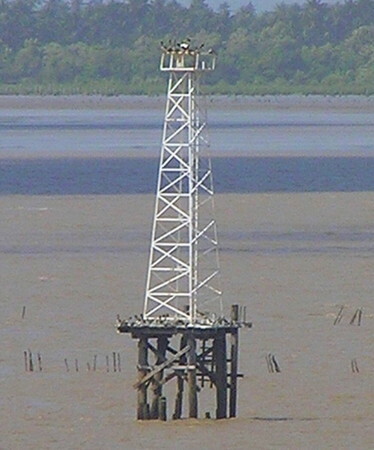 This light was listed as a 12 m (39 ft) skeletal tower on a wood platform. NGA notes that the light was reported extinguished in 1996 and Capt. Peter found that only stubs of the pilings remain. Located about 10 km (6 mi) north northeast of the mouth of the river. ex-Admiralty J6854; ex-NGA 17320. Around 2011. Active; focal plane 13 m (43 ft); quick-flashing white light. 13 m (43 ft) square skeletal tower mounted on a wood platform supported by wood piles. The tower also carries a diamond-shaped slatted daymark, painted red. Trabas has Capt. Peter's photo. This light replaced a light, formerly listed by NGA, that had a focal plane of only 6 m (20 ft). According to Capt. Peter, the range lights were upgraded after large quantities of bauxite began to be shipped from New Amsterdam. Located off the entrance to the Berbice estuary, which leads to the port of New Amsterdam. Accessible only by boat. Site open, tower closed. Admiralty J6858; NGA 17324. Around 2011. Active; focal plane 18 m (59 ft); white flash every 5 s. 18 m (59 ft) square skeletal tower with gallery, painted white and mounted on a wood platform supported by wood piles. The tower also carries a diamond-shaped slatted daymark, painted red. Trabas has Capt. Peter's photo (also seen at right). This light replaced a light that had a focal plane of only 12 m (39 ft). Located 1.4 km (0.9 mi) south southwest of the front light. Accessible only by boat. Site open, tower closed. Admiralty J6858.1; NGA 17328. 1909. Inactive since sometime before 1975. Approx. 25 m (82 ft) square cylindrical wood tower of the New Amsterdam Town Hall. Wikimedia has a historic (1950) photo. Capt. Peter visited New Amsterdam in January 2013 and was told that the old town hall had been demolished in 2012. The Guyana Chronicle has photos of the deteriorated tower being removed by a crane on 10 June 2012. There is interest in rebuilding the tower, but no one has the $16.5 million this is estimated to cost. Located in downtown New Amsterdam, on the east bank of the Berbice River about 7 km (4 mi) south of the river's mouth. Demarara Beacon (1932-2000? ), entrance to Georgetown. It appears that nothing remains of this light. Posted July 7, 2003. Checked and revised March 22, 2019. Lighthouses: 6. Site copyright 2019 Russ Rowlett and the University of North Carolina at Chapel Hill.